Order a memorial brick to pay tribute to a family member or friend who served in the military. 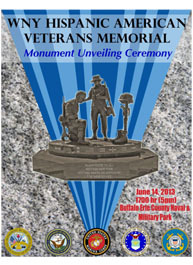 Click here to download the form to order a commemorative brick. You can create a lasting tribute to loved ones who served their country. These husbands, fathers and grandfathers, sons and daughters, friends and neighbors overcame a once in a generation challenge and they deserve a memorial that wll last for generations to come. 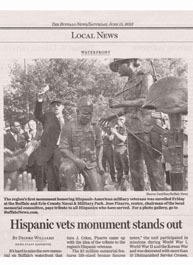 It's not just a paver/brick "It's Their Story"
We're pleased to offer the following information about Hispanic-American Veterans. 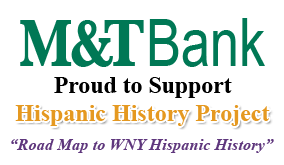 We have two PDF documents which you can view here: US Latino Patriots and Honoring the Untold Story. These documents are courtesy of Flora Richards-Gustafson. 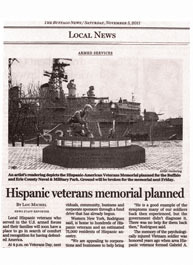 You can find other veteran articles like this one on her blog at latinlife.com. 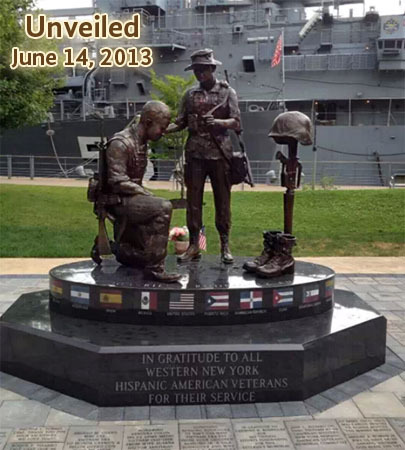 This memorial site is the aspiration of a few dedicated Western New York veterans known as the “WNY Hispanic American Veterans Memorial Committee.” It honors all Hispanic American Veterans past, present and future. 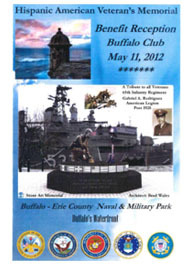 The site recognizes the five branches of the Armed Forces: Army, Navy, Air Force, Marines, and Coast Guard. It allows anyone wishing to participate an opportunity to perpetuate the memory of their loved ones who have given their life in order to bring about democracy and maintain peace within our world. Whenever a serviceman or woman dies in the line of duty, it is customary to arrange their Boots, Rifle, and Helmet as depicted in the picture of the monument. This arrangement is called the Battlefield Cross, Battle Cross or the Fallen Soldier Cross. The Battlefield Cross symbolizes a fallen warrior or hero. The rifle pointing downwards into the ground is a memorial of a soldier killed in action. The rifle is capped with a helmet and perhaps dog tags, and at the bottom, a pair of combat boots to represent the last march of the battle. These three items are essential gear for all service members, now the service member has no further need for them. A life size lone infantryman accompanied by a female war comrade is reverently kneeling in front of the Fallen Soldier Cross paying his last tribute to a comrade. The 2 bronze sculptures sit atop of a black granite ellipse which symbolizes eternity. The top of the ellipse has a written inscription in tribute to the Gabriel A. Rodríguez American Legion Post No. 1928 and the 65th Infantry Regiment also known as "The Borinqueneers". The outer edge of the ellipse has 22 engraved flags; the United States of America (USA) flag and 21 Latin American flags from the Western Hemisphere where most Hispanic-American Veterans trace their Spanish Speaking ethnicity and races (roots). Underneath the ellipse is a black octagon shaped granite with an engraved phrase saying “In gratitude to all Hispanic-American Veterans for their service.” On the opposite side are the 5 engraved emblems of all the Armed Forces: Army, Air Force, Navy, Marines and Coast Guard. A Tri-Sided Glass/Metal Panel displays the listings of Contributors, Committee Members and Credits but primarily serves as an educational graphic display. 5 benches surround the site allowing time for respite and reflection. The ground is adorned with 460 personalized engraved brick pavers. This allowed public and private participation in the process of “leaving a legacy”. The “Fallen Soldier” sculpture is life-size and life-like in every detail. It is cast in American bronze. In its standard form the sculpture measures 45” tall including the bronze base and the base measures 18’ wide x 22” from front to back x 7” tall. The weight is approximately 150 pounds. The patina (coloration) is a traditional chocolate brown (also known as statuary brown). Four mounting nuts are welded in each corner under the base of the sculpture for secure and permanent installation on the granite base. This is a classic quality state and built to last for hundreds of years. The infantry soldier sculpture is a life-like infantry female soldier accompanied by a bronze male comrade kneeling down reflecting and paying homage to a fellow soldier. The statue measures 35” tall x 33 long x 24 wide. The area is covered by pavers. 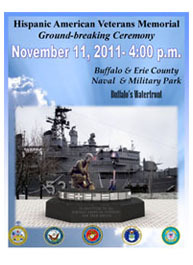 Inscribed pavers memorialize the men and women who have served our country and are now deceased. 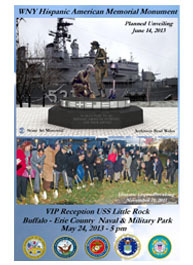 The public is able to pay tribute to our American spirit and immortalize their family or friends by sponsoring a memorial brick in the Walkway.